I hope all is well. Oh how I’ve missed you! We’ve still been on the road between Louisiana and Texas with ours and friends’ baby showers and the final phases of moving. YES! On my last style post, I featured one of my absolute favorite maternity pieces by ASOS Maternity which came from consignment boutique, Motherhood Closet. If you missed it, you can check it out here. Today, I’m going to feature 2 more dresses (yes I love dresses) from MC which have been my go-to Sunday style picks over the past couple weeks. -Let me just start by saying I received soooo many compliments on this dress! People could not believe it was a maternity piece (thanks to modern maternity fashion design). 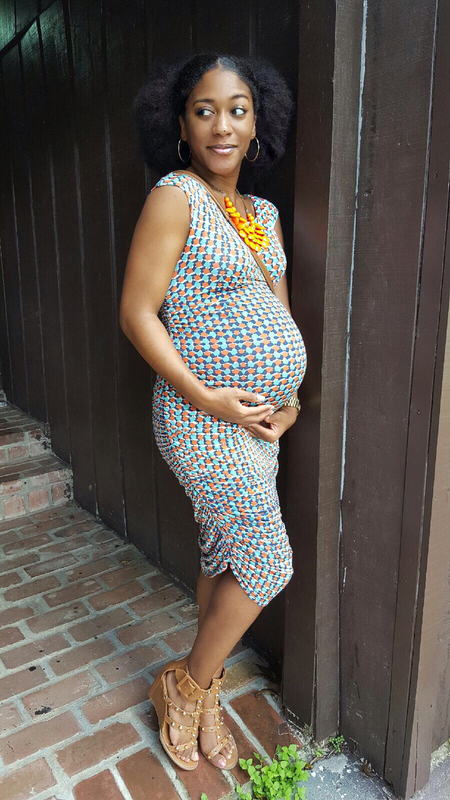 Gone are the days where us preggo ladies have to wear bag-like dresses that do everything but flatter and accentuate our curves! The material of this dress was to die for and the side ruching allowed for just the amount of stretch needed to cover my growing bump. Oh, and excuse my pup, Onyx, who felt she had to make a cameo in my offguard pic. Lol! Gotta love her. -When the term “comfort is key” was coined, this dress had to be the point of reference. 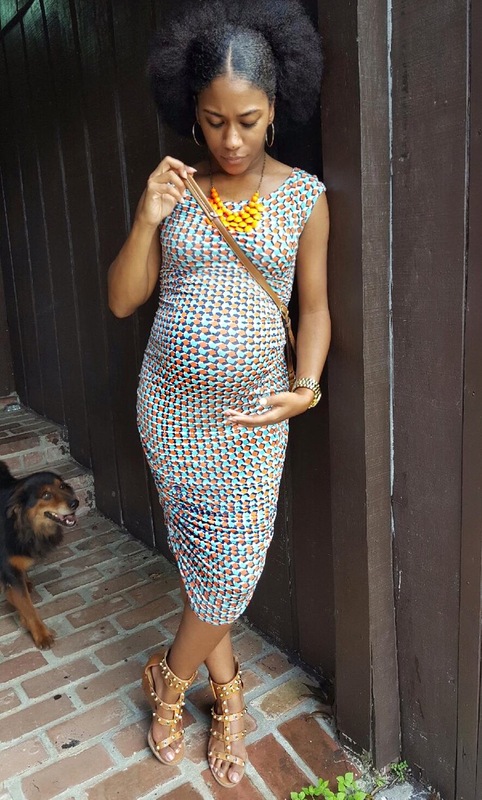 I actually just wore this dress this past Sunday for church, brunch, and to attend my classmate’s baby shower in Louisiana. Talk about versatility! This is a spin on your typical shirt dress as it adds a drawstring waist that can be tied below the belly. This is definitely a piece that can grow with you throughout pregnancy. In your early trimesters, you can simply drape the excess material over the drawstring or if you’re further along or a little plumper (like myself), you can appreciate the much-needed extra fabric in trimester 3. -I decided to add a little of my Louisiana / Texas gal flair by finishing this look with a good ‘ole pair of cowgirl boots. -I did have to wear a pair of black maternity tights under this dress as it was somewhat transparent. By the way, who says you can’t wear white after Labor Day? I’m pretty sure that whoever made that rule knew that it was made to be broken. I hope you guys enjoyed this week’s fashion spill. I’ve got plenty more coming your way. After all, our little man only has 4 more weeks of baking time, so be on the lookout for more maternity collabs with Motherhood Closet. Like what you’ve read? Have any comments, concerns, or questions? Comment below and/or share this post on your social media.